Israeli soldiers abducted, on Tuesday at dawn, at least twelve Palestinians, and injured one, during massive invasions in several parts of the occupied West Bank, the Palestinian Prisoners’ Society (PPS) has reported. The soldiers stormed and ransacked dozens of homes across the West Bank, including occupied Jerusalem, and abducted the twelve Palestinians. They also shot a young man, after the army assaulted Palestinians protesting the invasions. Dozens of soldiers invaded Qalandia refugee camp, north of Jerusalem, before initiating extensive and violent searches of many homes, abducted five young men, and took them to several detention and interrogation centers in the Jerusalem. The abducted Palestinians have been identified as Wajeeh Haitham Khatib, Ibrahim Hasan Assaf, Mahmoud Mohammad al-Louzy, Osama Naim Hamad, and Ezzat Mohammad Hazeen. 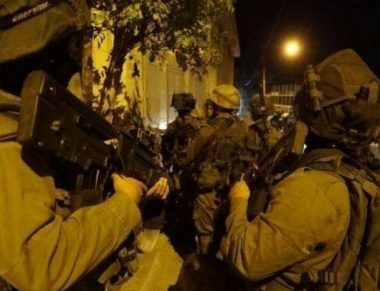 In Hebron, in the southern part of the occupied West Bank, the soldiers invaded and searched homes in several parts of the governorate and abducted four Palestinians. The soldiers abducted Obeida Issa Asafra and Laith Rasmi Asafra, from their homes in Beit Kahil town, northwest of Hebron. They also invaded many homes in several parts of Hebron city, before abducting Hafeth Hisham Sharif and Mosallam Qawasma, and installed roadblocks at the main entrances of Sa’ir and Halhoul towns, in addition to Hebron’s northern entrance in Jouret Bahlas area, and the entrance of the al-Fawwar refugee camp. The soldiers stopped and searched dozens of cars and interrogated many Palestinians while inspecting their ID cards. In Nablus, in northern West Bank, dozens of soldiers invaded the New Askar refugee camp, east of the city, and ‘Aseera ash-Shamaliya town, north of the city, searched homes and abducted three Palestinians. The Nablus office of the PPS said the soldiers abducted Adel Qar’awi and Montaser Araishi, from their homes in Askar refugee camp. It added that the soldiers also attacked Palestinians, who protested the invasion, and shot a Mohammad Jom’a, 20, with a live round in his thigh. The soldiers also abducted Dirar Hamadna, from his home in ‘Aseera ash-Shamaliya town, north of Nablus.